I've been looking for a digital writing tablet for my kids. They both spend lots of time drawing and writing. My younger son has had a magnetic tablet for a few years and it gets lots of use and is very battered! I'd like a digital version now my boys are getting older because I love the concept but they need something with a higher resolution. I've been looking into the options we have available. Practising spelling, reading words and sums. E.g. I'll write down a sum and my kids will answer it. Playing hangman and similar games in the car. Keeping the kids quiet in hotel rooms and other venues where they can't make lots of noise. Could we use an ordinary tablet instead? Well at the moment we just have 7" tablets which are a bit too small for this purpose. And I like the idea of a paper-like experience. Also I like the idea of a device that's just for drawing and writing so they don't get distracted and start playing Angry Birds instead of finishing their masterpiece. I also want something that's always ready so you can just pick it up and start drawing / writing. 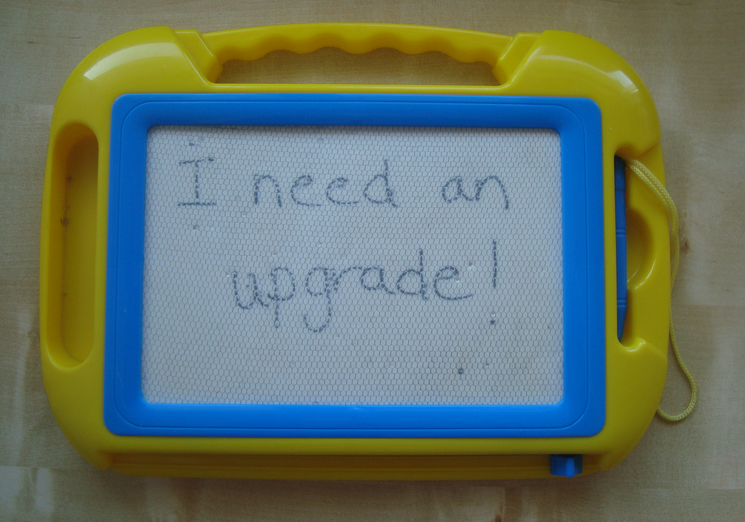 The current generation of cheaper LCD writing tablets are fairly limited in what they can do, but then so is the magnetic drawing board that we're upgrading from and that gets loads of use! The main contender in this category is the Boogie Board from Improv Electronics. The Boogie Board is probably the best known LCD writing tablet and is a popular choice for kids. It comes in lots of bright colors and a choice of sizes. The 8.5" version is very good value and easily portable. For larger works of art there's a 10.5" version. You also get a stylus. This is a great device for kids who love to draw and a good way to avoid ending up with tons of waste paper each day. There's also the Boogie Board 8.5 Inch JOT LCD eWriter (Red) which has magnets so you can stick it to the fridge or other suitable surface. It also comes with a stylus which stores in the top of the case. The next step up is the Boogie Board Rip which allows you to save work as a PDF file. You can then sync with a computer via a Micro USB cable. This is a very neat feature. But it does push up the price. The Rip is available in a 9.5" screen size which is a good size for drawing. I like this device a lot, but I think it's quite a lot of money to spend on a drawing device for kids. I think this device comes into its own for older kids and students who need something to take notes on. The only thing that has been putting me off getting a couple of the basic 8.5" Boogie Boards for my kids is that there are new versions out later this year which can save images wirelessly and sync with a computer so kids can even share their creations on a large screen as they work. The expected price for the newer versions is US$99 though which is considerably more that the basic version. Admittedly taking a quick photo with the camera isn't that hard to do. Maybe I've just talked myself into going with the basic version! I'm certainly getting fed up with all the sheets of paper that only have a words or two or a quick scribble on them.